The Basics: A filet mignon is a boneless cut of meat taken from the tenderloin of the animal. So what makes it so special? This cut is known to be extremely tender. According to Omaha Steaks, this is because “the tenderloin remains relatively unused before being processed as beef. Inactivity keeps the muscle from growing too tough through repetitive movement.” Essentially, because these muscles aren’t being overworked, the tendons don’t toughen much, leaving the meat much more tender and juicy than other cuts. The Cut: So how does one choose the perfect filet? Important factors to keep in mind are color, size, and USDA grade. Your steak should be a “uniform dark pink/red,” with clear lines of fat running through it. Size is to preference, but remember that thicker cuts are ideal if you like your meat on the rarer side. And when it comes to USDA Grade, a Prime rating is the way to go, but it’ll cost you. Prime beef can boast beautiful marbling (though it’s rarer with filets) and is ideal for broiling, roasting, and grilling. USDA Choice grade is more common, found in most grocery stores, and is still a great way to ensure that your meat is high quality. You can learn more about USDA beef grades here. How To: As a classic, filet mignon should be treated as such — so no crazy tricks here. To start, we’re preheating one of our favorite smokers, the Lynx Professional Sonoma Gas Smoker, to about 450 degrees Fahrenheit. We recommend seasoning your steak with salt, pepper, butter and garlic before throwing it on the grill for about 6-8 minutes on either side depending on how you’d like your meat cooked and the size of your filet. Our friends at Traeger Grills have a delicious filet mignon recipe to follow if you need some extra inspiration, featuring Jacobsen Salt Co. salt, which is available in-store at BBQ Island! 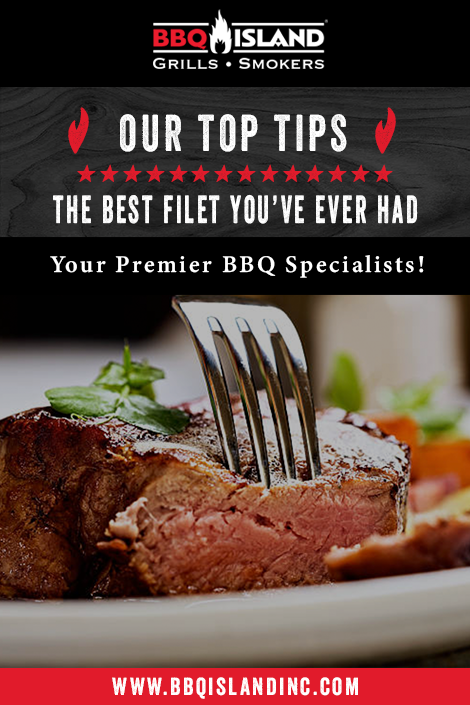 Before you fire up the grill this National Filet Mignon Day, make sure you stop by one of three BBQ Island locations in Arizona or https://www.bbqislandinc.com/ for all of your tools, tips and tricks.